So, this event chart looks good to me! The job is more of a career move (10th house) than a day-to-day job (6th house). 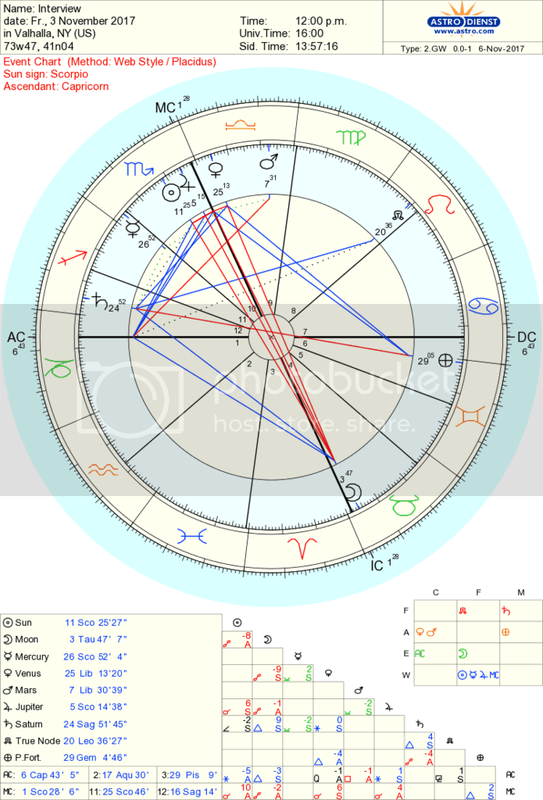 I have the Sun and Jupiter in the 10th house conjuncting the MC and Venus conjunct the MC from the 9th house. I also have POF in the 6th house, trining the MC, just for good measure. The interview went very well and I have high hopes for it! What does everyone else see/think? I found out yesterday at around 4:30 that I got the job! Yay! I start November 27th! The interview felt really good and the people I met were awesome and, I hate to sound too new age-y (although I am on an astrology board), I felt good vibes from them. Hope the 27th is a great day! Wow ok that's interesting because you're Saturn and the job is ruled by the 10th house whose ruler is Mars. Saturn and Mars aren't aspecting in this chart which means no job since the significators aren't in aspect. However Mars is in the sign of Saturn's exaltation, Libra so that shows that Saturn (you) really wants Mars (the job) because you know you'll do well in it (since Mars is in Libra and Saturn exalts in Libra aka Saturn KNOWS it operates and does things well in Libra). I'd say Mars (the job) receives Saturn (you) which means the job receives you into it. That's the only way I can make sense of you getting the job since your significators don't aspect. Also, perhaps since the MC (job) is only at 1 degree of Scorpio it could still have that Libran energy to it and Libra is ruled by Venus and Venus and Saturn (you) just left sextile.